While chimney caps for masonry chimneys are not required by code as part of a chimney system, they can really save money on future maintenance issues and headaches down the road. Chimneys are bombarded by the element's year round, a chimney flue if unprotected will be open to rain, sleet and snow running into the chimney year round. Once the water gets in, there is no where for it to go, it can end up at the bottom of your heating flue, on the smoke shelf behind the damper of your fireplace, seeping into the mortar joints of your flue liner causing deterioration to those joints during freeze-thaw cycles and the eventually into the brick and mortar of the chimney itself, and this moisture will eventually erode and compromise the integrity of your chimney. Connecticut homeowners face a further challenge and damages caused by the moisture freezing and thawing during the winter. Metal fireboxes and dampers are of obvious concern when this happens but many times they are neglected until its too late. Another reason to cap a chimney is to keep small animals out. An uncovered chimney an appealing place to make a nest for birds, raccoons and squirrels, especially when the weather starts getting cold. They feel the warmth of your roof and want to build a nest close to the heat. If you've seen the nest that squirrels build in trees, imagine all of those leaves in your chimney with your new "house guest." The only way to get rid of that mess is to call a wildlife specialist while a simple mesh chimney cap could have prevented it. Additionally, an unprotected chimney becomes vulnerable to the winds of Fall carrying debris, leaves and twigs that can end up in your chimney and create blockages. As you can see it really makes a lot of sense to have a chimney cap installed or replace caps that have worn out, if nothing more than to increase the life of your chimney liner. 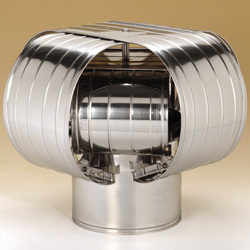 If you are worried about price, don't be, capping a chimney can be done for as little as $150.00 dollars for a single flue stainless steel cap, including labor. Specialty caps can cost more, but the fact is whatever price you pay; it is much cheaper than having to repair the damages caused by not adding one this season. Give us a call for a free estimate for your chimney cap needs today! Masonry Chimney Caps can be single flue or multi flue design and come in cheaper Galvanized (6 year rust through Guarantee) Stainless Steel (Lifetime Guarantee) or more expensive Copper (lifetime Guarantee). Factory-Made Metal Chimneys are required to have chimney caps. These types of chimneys are used in most condos and some residential homes. When these chimneys are installed during new construction the caps that are included with the Factory Built Chimney are sometimes cheap Galvanized and will rust out within a few years. When we replace these caps we only use Stainless Steel. 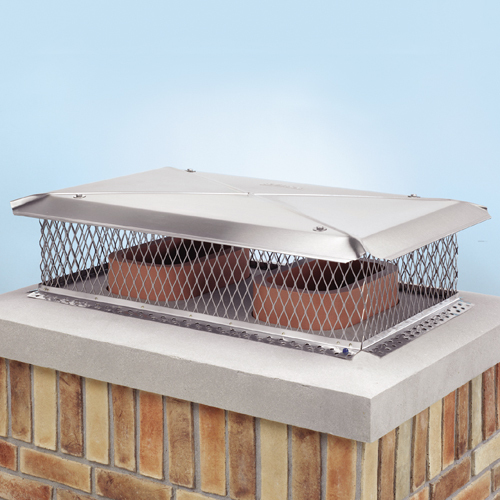 Specialty Caps - Vacu-Stack: This is the premier chimney cap for solving common, wind-related draft problems. These problems often occur for homes that have hills, mountains, tall trees or buildings in the vicinity. This cap also functions as a conventional chimney cap by protecting the chimney from rain, snow, debris, and animals. It is designed for round chimneys that are not air insulated (also called air-cooled). The Vacu-Stack can also be installed on a square or rectangular chimney using the Masonry Adaptor. Chimney cap with damper.. A device installed at the top of a chimney for the purpose of sealing the flue shut when the fireplace is not in use. They are often used as replacements for throat dampers that are installed just above the firebox when a masonry chimney is built. Top-sealing dampers are as much as 90% more efficient than throat dampers because they provide a silicone rubber gasket seal rather than metal to metal. 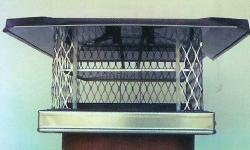 If your chimney has no cap and your fireplace damper is in question this item can take care of both. Yes, there is a lot to consider when selecting a chimney cap and this article is in no way geared to convince you to choose one option over another. 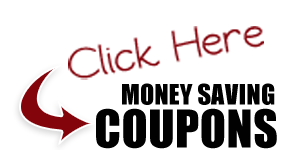 we are simply providing you with the information you need to help you make a more educated decision on your choices. Ultimately, you will want to have a chimney professional look at your chimney, and narrow down your choices to the options best suited for your individual needs and budget. Give us a call, we look forward to serving you! Give us a call at (860) 829-0128 or use the convenient contact form��for a free Chimney Cap consultation for your home! Serving central Connecticut homes including: Berlin 06037, Kensington, New Britain, Newington, Wethersfield, Rocky Hill, Cromwell, Middlefield, Meriden, Southington, Plainville, Farmington, West Hartford, Hartford, Cheshire, Wallingford, Durham, North Branford, North Haven, Hamden, Wolcott, Bristol, Burlington, Avon and surrounding areas!